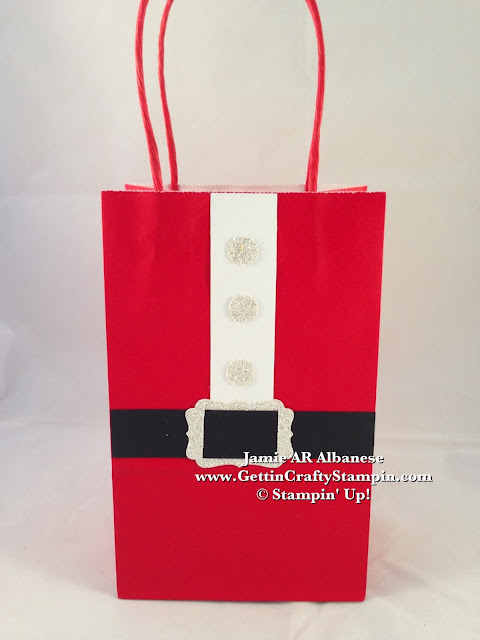 Ho, Ho, Ho... wrap up those gifts with this fun gift bag that took just a few minutes to create!! Have fun with Punch-Art this holiday season and gift a little giggle with those gifts.... while Wowing others with your creativity! With a 2"x5-1/2" Whisper White card stock piece adhere to the center of the bag with SNAIL. Punch the Little Labels Punch Pack 'buttons' and Decorative Label Punch 'buckle' out of the Silver Glimmer Paper. Cut slits in the 'buckle' with my Paper Snips (on a thick cutting board type surface) and thread this Basic Black card stock through for a genuine buckle look. 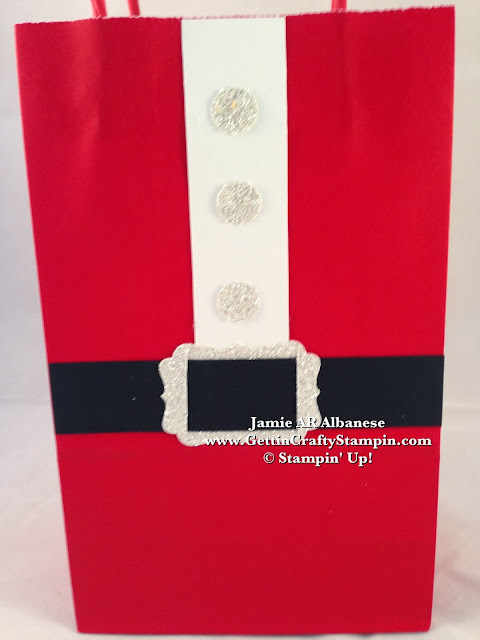 Adhere the buttons and the belt and buckle over the Whisper White for this cute Santa Bag! I'm so ho, ho, happy that you came by today! Don't forget to play Santa and place your order for amazing gifts with ME 24/7... do so soon to assure prompt holiday delivery! Punch Art is a great way to make a fun and Jolly bag this Christmas! I can't wait to use these fun bags that I quickly created while looking like I'm the next Martha Stewart (lol). This bag took just minutes to create and will last in their mind long after receiving it! Give a holly, jolly gift bag this year.